For the second assignment, we will have to produce a wearable jewellery piece and then the other part is to scale it or part of it up into a architecture sculpture.To be able to get what we want to do, we we were introduced to two different software, which are TopMod and Magics. 1. 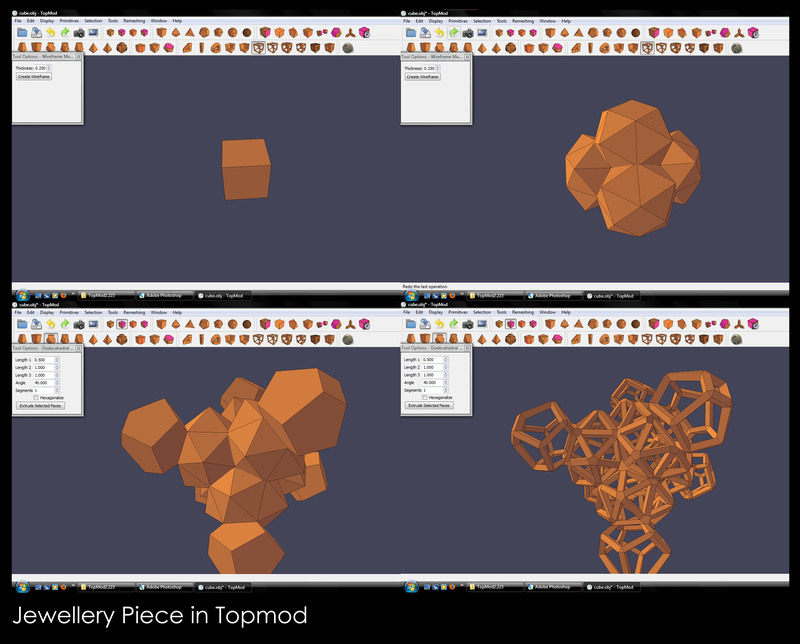 As a start, we will need to use TopMod to create a shape that we would like to use as the jewellery piece. Starting with TopMod, I started with a square and then play around with different command, playing with surface and edges. I finally came up with my piece of jewellery piece in wire frame. 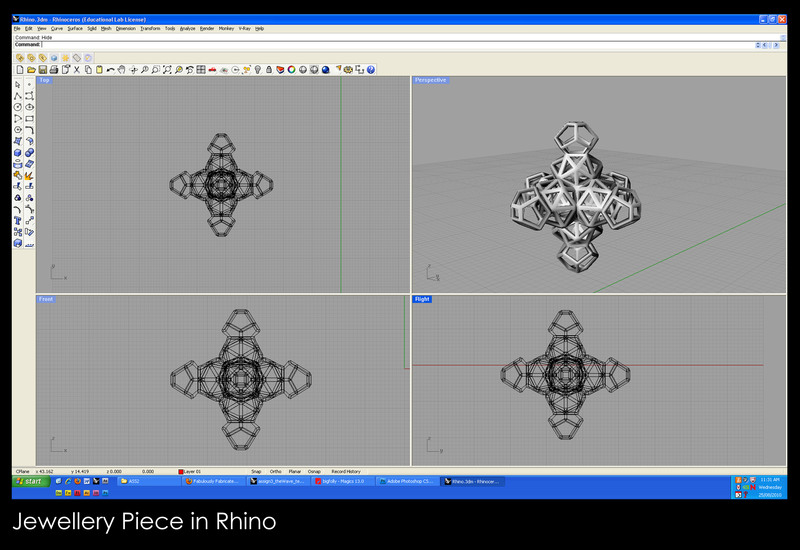 We’ll have to save it as *.obj file and to be ready to be used in Rhino. 2. Open up Rhino, then open up the *.obj file that we have. After that we’ll have to check the scale of the object as TopMod is a software that don’t give measurement and so we have no idea how big our jewellery piece will be. Scale it to a correct size, refer to the minimum thickness of the material that you wish to be printed on, for example, powder print and stainless steel print are both 3mm. It’s ready to be export and save. Save it as a *.stl file and it’s ready to make some fix-up in Magics. 3. 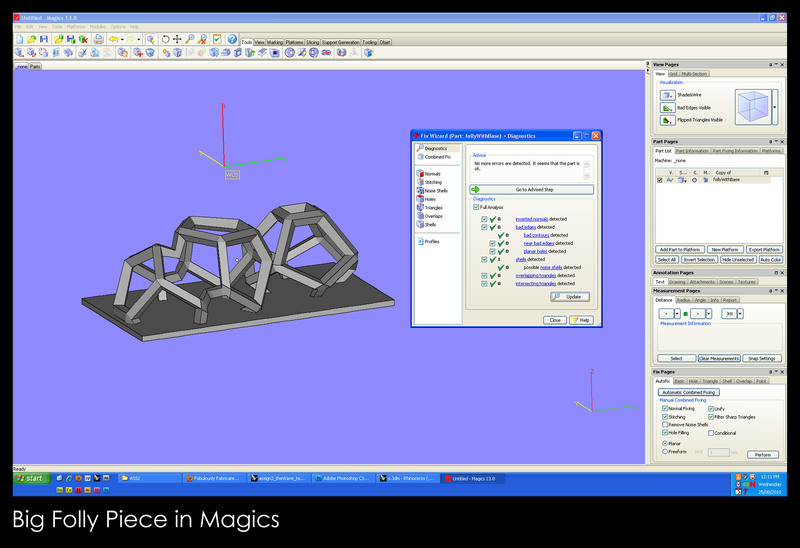 In Magics, after loading in the file, go to Tools>Fix Wizard and perform an auto fix to the model. Tick all the boxes if the model is to be printed in Shapeways, the last two boxes could be remained untick if the model is just to be printed in powder print in RMIT. (I tick all for both) Keep repeat updating and fixing the model. If we really couldn’t fix the model at the end, go to Stitch, increase the tolerance to 0.5mm. At the stage, model should be perfect and to be printed in whatever material. I’ll still use the Dimension tool in Magics to check the thickness of the model. Save it and it’s ready to be printed! *Save will only save the project as a Magics file, which is not the correct file to be sent to the printer. What we have to do is Save Part As, we are suppose to save the file to *.stl file and it’s ready to be printed! For the big folly model pieces, we are to create a space or a architecture sculpture from our jewellery piece. Take part of the jewellery piece or cutting it into different shapes, then make it into a space. 1. 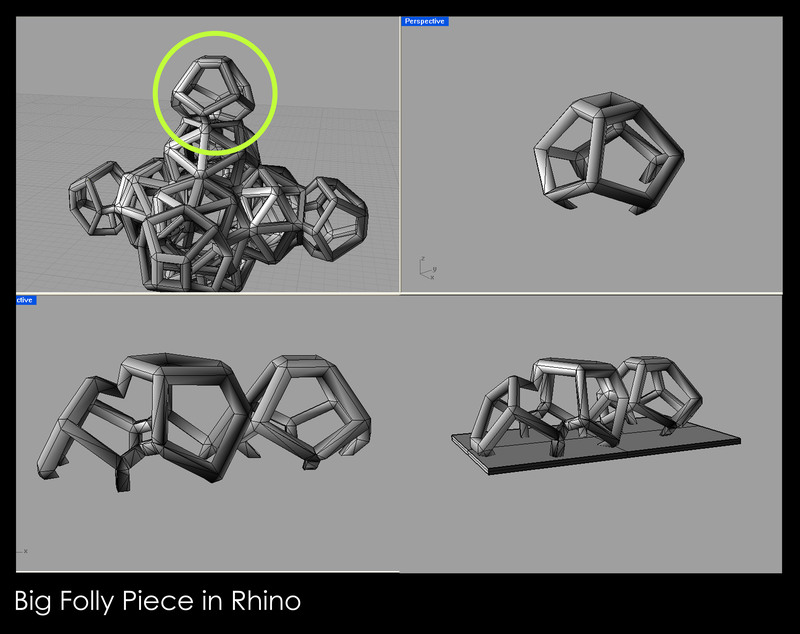 In Rhino, bring in the jewellery piece, scale it up even bigger, as required is max 100mmx100mmx100mm, min 75mmx75mmx75mm. Unweld the object and ungroup them and it’s ready to be cut. Draw a surface, that acts as the ‘knife’. I took the top part of the jewellery piece and multiple it and play around and then I came out with this. For my architectural model, it’s towards a longer model, therefore, it’ll be in a different measurement as required. For a smoother surface, you could try using this command: selsurface>mesh>moredetails, so that it’s smoother. Move the original surface to another layer, then select all, join. Then, we can weld it back again to make it look better. At last, we should check the mesh before we export it. Type in checkmesh, then select the object, then a report about the mesh will appear, telling you whether it’s a good or bad mesh. Finally, export! We’ll have to export it as a *.stl file for Magics to do the final fixing. 2. 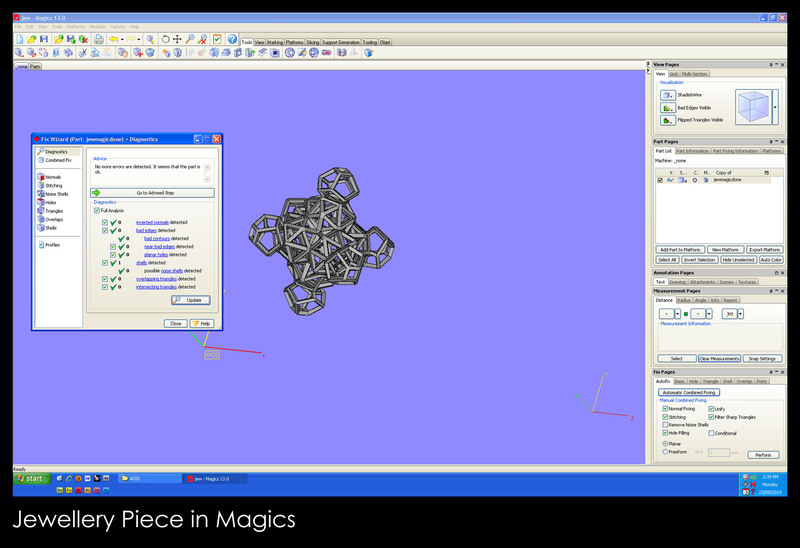 Open up the file in Magics, repeat the fix-wizard as we did for the jewellery piece. Export the fixed file to a *.stl file and it’s ready to be sent to print. *Both model are being printed at the moment. Will post photo soon. I use TopMod for everything! I love it!